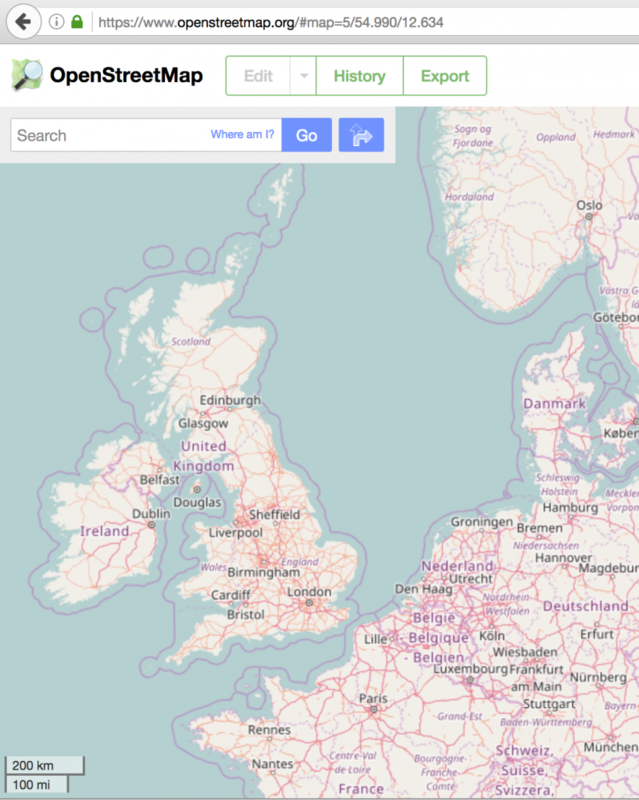 Open Street Map (OSM) is an open-data digital map of the world (similar in spirit to Wikipedia) created by millions of volunteers each improving portions of the map big and small. Anyone can edit the Open Street Map and to date over 2 million people have. As an open-data project, the raw points, lines, and tags in the data are usable by anyone without license fees, making projects like the open-source Curvature program possible. Curvature would not exist without Open Street Map and all of the contributors who have mapped the roadways of the world thus far. Because Curvature uses the Open Street Map — a world-map that anyone can edit — as its data-source, you too can improve the map and thereby improve the Curvature files the next time they are generated. For more information about the fabulous Open Street Map project, see the OSM help page. While there are many, many ways to improve the Open Street Map, there are several particular types of edits that are a big help in improving the Curvature output files: adding surface tags, fixing improper highway type tags, and smoothing jiggly segments. In some parts of the world almost every road segment (a “way” in OSM parlance) has an appropriate surface tag applied to it, allowing Curvature to filter out the unpaved roads — which are often small and very twisty! At the time of this writing however, many roads do not have a surface tag and so Curvature can’t filter them out, resulting in the really twisty paved roads getting hidden among hundreds or thousands of unpaved roads. You can help help improve the Curvature output by clicking through to edit the road segments in Open Street Map and adding appropriate surface tags based on your memory of travelling the road, the satellite imagery shown in the Open Street Map editor, or other allowed data-sources. In the United States, much of the Open Street Map road network was imported from the U.S. Census Bureau’s TIGER data-set. While this data-import provided a rich starting-point for mapping, it mis-categorized most roadways as highway=residential rather than using a proper highway. Roads that are unimproved forestry tracks or agricultural tracks (not to be confused with improved gravel or dirt roads) can be changed to highway=track and they will be filtered out of the Curvature. Similarly, mis-categorized driveways can be changed to highway=service and they will be filtered out. Aside from improper surface or type tagging, the last big reason roads will get improperly included in the Curvature output is when they are generally straight roads, but are defined by many close-together points that shift back-and forth across the road width. This can often happen when a road was surveyed using a GPS unit that didn’t have a good signal, causing the coordinates recorded to jump around. You can identify ways like this because they look straight but have high curvature-values. RoadCurvature.com is © Adam Franco. and are open-data provided under the terms of the Open Data Commons Open Database License (ODBL).